Another Quick Cleaning Tip for Busy Mamas Mama Say What?! | Mama Say What?! So I will be honest here, this is not a QUICK cleaning tip. In fact, it will probably take you longer to get your chores done, but in the essence of balancing house cleaning and providing an enriching experience for your little one in your life. My oldest (who is not quite 2 years old) absolutely LOVES vacuuming. He has a blast “push, push, pushing” and “back, back, backing up” with the vacuum. Of course, he actually adds a great deal of weight to the vacuum, but at the end of 30 minutes, our floors are usually clean and he was occupied for at least a half hour. Now, any time we start the vacuum and our little man hears it going he runs to whatever room it’s located and assists. 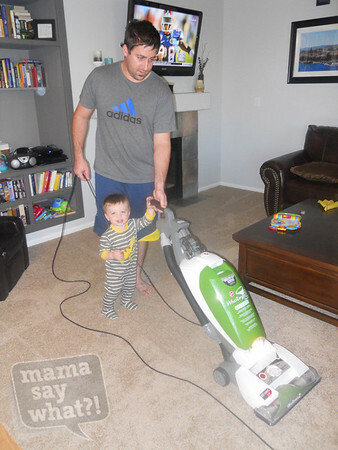 On certain occasions, my husband or I will whisper that’s what we are running to do in order to avoid a helper for the entire vacuuming experience but having him be there is usually quite heart-warming. He also has a blast taking a paper towel and cleaning with mommy, so I have a little duster in the making. Even though my daily cleaning can take twice the time, we have fun together as a family and that alone makes the extra time totally worth it! When he gets older I will remind him that he used to love helping. Even More Uses for White Vinegar! Added by Corey P. on February 1, 2013. This is so cute. N LOVES to help now too. I don’t look forward to the day that changes.